I pretty much love this outfit because it is so comfortable and a great way to layer up because the fabrics are so lightweight. I was the model for Lowry's Farm when it launched in Bugis+ in July and they were kind enough to give me one of the outfits which I modeled and this blazer was one of them. It is really very comfortable and goes well with a lot of different outfits! I also especially love the rose gold pleated skirt from CO. by Cotton On because its color is just so pretty and it reminds me of those Roman gladiator skirts! I love rose gold accessories as well - its soft peach hue tint gives a dash of femininity to the otherwise plain gold. This was shot at the rooftop where I live in school - yup complete with a swing - great for late nights when it is really breezy and you can see all the way to the west coast harbour. love this outfit and the neutral colour tones! This outfit is so lovely and feminine. It certainly looks comfortable as well, and I love your moccasins, especially the fact that they're thrifted! People often fail to realize it, but thrift stores are an amazing source for unique, lovely pieces at crazily affordable prices! I just wish there were more thrift/vintage stores in Singapore! 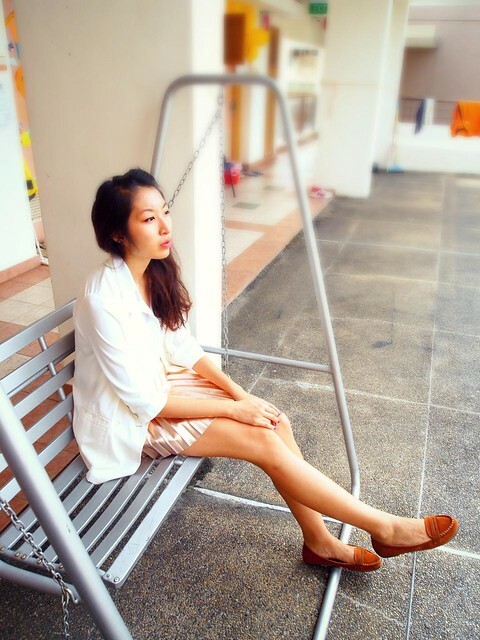 I'm a Singapore fashion blogger as well, a fifteen year old aspiring fashion journalist to be exact! I'm following your blog now and have followed you on Twitter too.